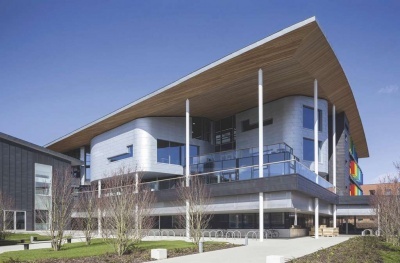 The exposed precast plank soffits are an important visual element and are also utilised for thermal mass in the naturally ventilated upper levels. The coordination of the steelwork support details was therefore of great importance, particularly at the column to soffit junction, which included support plates for the planks, substantial torsional connections for the beams, and a connection for an inverted tee beam which acts as a frame tie. Flexibility and efficient distribution of services were critical to this project. 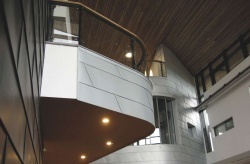 The solution was to use long-span floors supported on steel slimfloor beams, which also enabled natural ventilation. Four storeys are arranged under a doubly-curved roof, reflecting the adjacent building to which it neatly links.